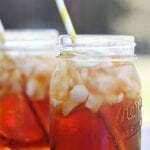 The perfect recipe for ultra smooth sweet tea. Bring 4 cups of water to a boil, remove from heat and add tea bags. Let tea steep for about 10 minutes. Remove tea bags and add sugar to hot water. Pour tea and sugar mixture into large pitcher. Add 12 cups of ice water and stir until cooled. Makes one gallon of sweet tea.